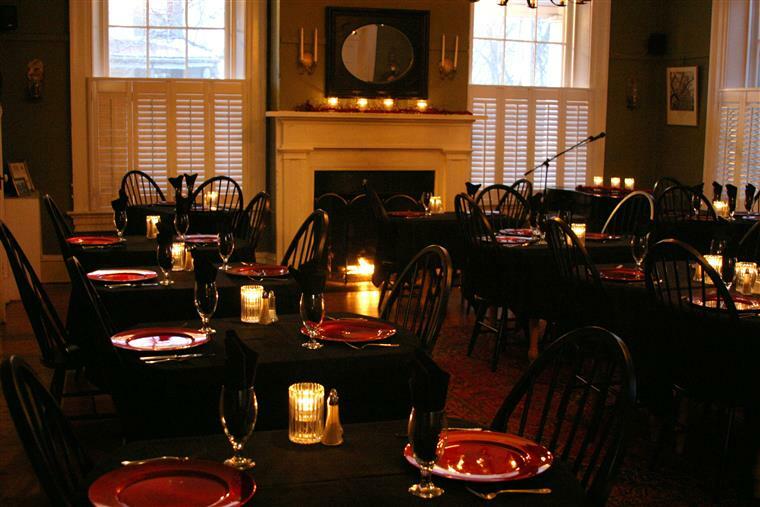 The Lafayette Inn & Restaurant’s private dining space is perfect for rehearsal dinners, wedding receptions, business meetings, and private dinner parties. We will work directly with you to organize the related details for your event, from a custom menu, room set-up, bar services, and coordinate requested outside services (Florist, cake, wedding/meeting planner). We have experience with nearly 300 such events- Let us lend our experience to you! When planning a catering event, we sit down with you and help prepare the most perfect and memorable experience possible. Aside from selecting the meal service options, (buffet, passed appetizers to plated service) we explore the full range of wines that may be offered. Each catering event is custom designed to ensure personal results. Quality food, interesting presentation, and superior service are never compromised because of group size. The Inn has become a favorite destination for wedding receptions and special events. A number of venues are available to our clients. Elegant Formal Events for parties up to fifty people are served in our Dining room. Expansive Buffets for larger events can be held in our Courtyard (just off of the dining room). Work with our Catering Consultant to select items from our popular menu, or provide us with a "Wish List" and let the Chef(s) deliver! Social Events and Business Meetings for groups smaller than twenty-five can be hosted in our Tavern Room. We will be happy to provide a Chef’s Choice menu to suit any budget. Whether you wish to conduct business in a private setting or an intimate dining experience, we will be happy to set up to suit your needs. If you are planning your wedding, consider The Lafayette Inn as your destination. We are a full service wedding destination. Please visit our Wedding Page for more details. Open daily for events, both on-site and off-site. we’ll work with you to create a personalized, enjoyable, and memorable event. We will do everything possible to create a positive experience for every one of your valued guests. the Lafayette Inn & Restaurant is happy to assist you in creating the perfect private dining event. We will work with you on everything from the menu, service style, wine/beer/bar service to the table layout and beyond. Our Tavern is perfect for smaller intimate dining, the dining room for larger and reserve the entire restaurant for an even broader guest list. The Lafayette Inn & Restaurant is open 7 days a week for events. From passed appetizers to heavy Hors d'oeuvres, local craft beer and wine to cocktails, we are ready to assist you in organizing a perfect cocktail party. You play the role of host/hostess, (and enjoy YOUR party) let us work in the back, do the clean-up and wash the dishes!